In the midst of a raging war over currency exchange rate between the US and China at the G-20 Summit in Seoul, India on Friday cautioned against competitive devaluation and advocated that any resurgence of protectionism be resisted. India also spoke against talk of putting a cap on current account balance, proposed by the US at four per cent of the Gross Domestic Product (GDP), saying it is not easy to reach agreement on what are sustainable current account balances for individual countries given the structural differences across the countries. 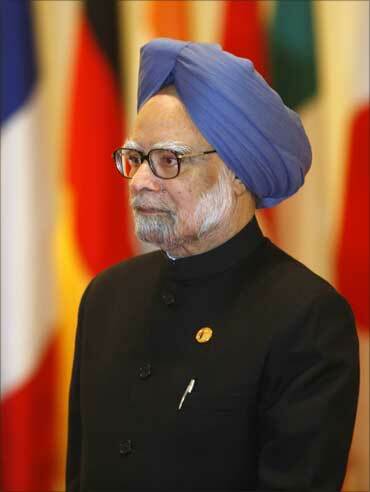 India's forthright views on these and major issues troubling the fifth G-20 Summit were put forward by Prime Minister Manmohan Singh, who spoke at the Plenary Session of the Summit that opened this morning under South Korean Presidency chaired by President Lee Myung-bak. US President Barack Obama, Chinese President Hu Jintao, British Prime Minister David Cameron, Canadian Prime Minister Stephen Harper, French President Nicolas Sarkozy and German Chancellor Angela Merkel are among a host of world leaders attending the Summit. Image: Prime Minister Manmohan Singh arrives for the opening plenary session of the G20 Summit in Seoul on November 12, 2010. "First, we must at all costs avoid competitive devaluation and resist any resurgence of protectionism," the Prime Minister said on the raging issue of the US attempts to make China reevaluate its currency yuan and America pumping in $600 billion into its economy that will effectively undervalue the dollar. On the US attempts to cap current account balances at 4 per cent, the Prime Minister said "it is not easy to reach agreement on what are sustainable current account balances for individual countries given the structural differences across countries, the many uncertainties that prevail, and the multiple goals that each country has to balance." Despite these difficulties, Singh said the G20 must persevere to develop a workable mechanism for international coordination. Noting that there is considerable agreement on some broad principles, Singh said advanced deficit countries must follow policies of fiscal consolidation, consistent with their individual circumstances so as to ensure debt sustainability over the medium term. "This means that fiscal correction need not be front-loaded everywhere... while structural reforms are necessary everywhere, these should increase efficiency and competitiveness in deficit countries, while expanding internal demand in surplus countries. This re-balancing will take time, but it must begin," he said. Singh said exchange rates flexibility is an important instrument for achieving a sustainable current account position and policies must reflect this consideration. Image: Prime Minister Manmohan Singh and his wife Gursharan Kaur arrive for dinner at the National Museum of Korea in Seoul on November 11, 2010. To these well known ingredients, the prime minister said, he would add another that has not been sufficiently discussed. "Even as we try to avoid a destabilising surge of volatile capital flows to developing countries, there is a strong case for supporting long term flows to these countries to stimulus investment, especially in infrastructure," he said. Singh said the economic performance of emerging markets, including many countries in sub-Saharan Africa, has improved greatly in recent years. He said these countries are now in a position to absorb capital flows aimed at an expansion in investment, which would inject much needed demand into the global economy and that Multilateral Development Banks have an important role to play in this process through recycling of global savings. "Many emerging market countries are also in a position to attract private investment, including into infrastructure," he said. "Recycling surplus savings into investment in developing countries will not only address the immediate demand imbalance, it will also help to address developmental imbalances. In other words, we should leverage imbalances of one kind to redress imbalances of the other kind," he told the G-20 leaders. Image: People are reflected on a sculpture in front of the Coex Convention Centre, the venue of the G20 summit. Prime Minister Singh said high unemployment in industrialised countries threatens a revival of protectionist sentiment, especially since the use of conventional monetary and fiscal tools to revive the economy has been exhausted. "Uncertainty about the prospects of industrialized countries affects the investment climate and dampens the medium term growth prospects of emerging market countries. All this suggests that much remains to be done to bring our economies back to the path of strong, sustainable and balanced growth," he said. Noting that the problem facing the G20 countries in rebalancing the global economy is well known, he said major industrialised countries were running unsustainable current account deficits which have to be reduced to manageable levels. "If this is not to have a contractionary impact on the world economy, it must be offset by reducing current account surpluses elsewhere. This rebalancing requires pursuit of appropriately coordinated policies in our countries," Singh said. He said the Mutual Assessment Process adopted last year during the 3rd G20 Summit in Pittsburgh in the US was a unique initiative to achieve such coordination. Singh said the members of the grouping saw the outcome of the first stage in Toronto at the level of country groupings and had expected to move to the second stage of considering country specific recommendations by the time of the Seoul Summit. "The G20 would convey a powerful signal to markets if we commit ourselves to a second stage MAP process aimed at coordinating policies in these areas," he said. 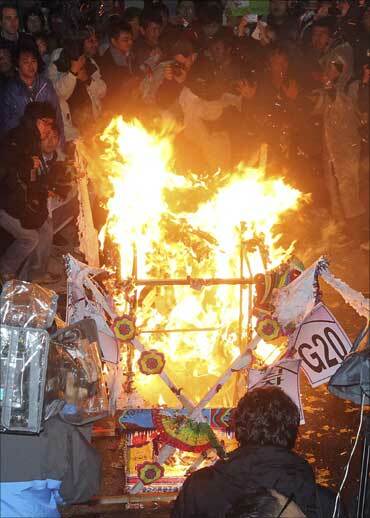 Image: Demonstrators set fires during anti-G20 protest in Seoul. Singh said finance ministers and central bank governors of G20 countries "could be asked to develop these ideas further, with the assistance of the IMF and produce, as quickly as possible, a credible approach to identifying sustainable trajectories for external balances for our countries and to assess the policies proposed by each country to achieve these." "I recognise this is not going to be easy and we must allow considerable flexibility to accommodate learning by doing. However, if we can actually do this, we will have made a lasting contribution to a new style of global governance," the prime minister said. Singh complimented the Korean presidency for the initiative it took to include development as an accepted item in the agenda of the G20. "The G20 was born at the time of a crisis and as such it has been preoccupied with the short term agenda of crisis management and global rebalancing. However, one of the biggest imbalances facing us the development imbalance and putting development on the G20 agenda fills an important gap," he said. He said developing countries performed well in the years before the crisis and have also done well in subsequent years. "However, we need to ensure that the global economic environment, including especially the environment for trade, and investment flows remains strongly supportive of development," Singh said. Image: US President Barack Obama (R) listens to South Korea's President Lee Myung-bak at the National Museum of Korea prior to dinner in Seoul. Singh said the Seoul Development Consensus and the associated Multi- Year Action Plans which are before the G20 countries provide a comprehensive agenda with timelines which should be pursued in all relevant fora in the months ahead. "I am particularly happy to endorse the focus on facilitating investment in national and regional infrastructure projects and the call for establishing a High Level Panel to recommend measures to mobilise private, semi-public and public resources for infrastructure investment and to review MDB policy in this area," he said. Infrastructure is a critical constraint to rapid and inclusive growth in most emerging markets and we need to find innovative ways of meeting the enormous costs of infrastructure development, the Prime Minister said, adding that this should be made a major focus of the MDB agenda. Singh said the emphasis on development of employable skills is also extremely important and that his government in India is giving high priority to skill development in its effort to provide access to quality jobs to the large numbers of new entrants' labour force. 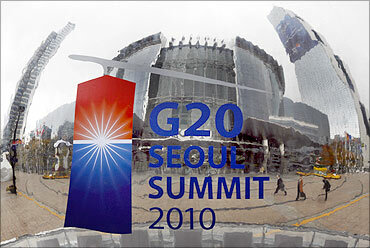 "The Seoul Summit is also delivering on the promise of reform of the IMF. We have agreed to a shift in quota shares of 6 per cent to emerging market countries and the composition of Board is being changed to reduce the European representation," Singh said. "With the additional resources already provided to the IMF, we have not only provided the IMF with the firepower that it needs to perform its stabilisation role, but also moves it in the direction of greater democratisation," he said. The Prime Minister said further moves are necessary in this direction and India welcomes the decision to comprehensively review the quota formula by 2013 to reflect the growing economic weight of the emerging market countries. "This should be fully reflected in the next quotas review due to be completed by 2014," he said. Singh said the G20 countries should ensure that the Doha Development Round of multilateral trade negotiations is brought to a satisfactory conclusion. "We have seen a resurgence of protectionist sentiment in the world in the wake of recessionary trends. It is commendable that actual protectionist action has been more limited. The only way to ensure that protectionism does not gain the upper hand is to restore momentum to the trade talks. 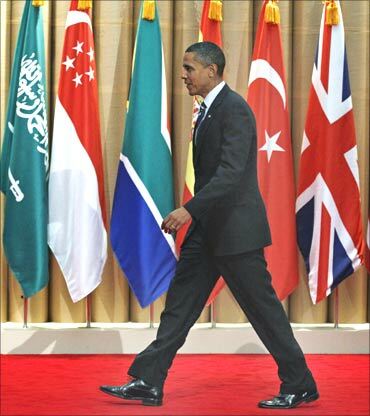 I hope the G20 will land in their weight to this objective," he said. 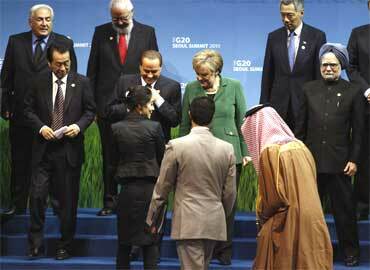 Singh said the G20 was an apt response to an adverse situation that the world faced. "A few years down the line, the world will ask as to what else did G20 achieve other than averting a total breakdown due to the global financial crisis," he said. 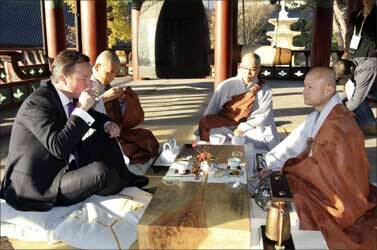 Image: Britain's Prime Minister David Cameron (L) drinks tea with monks at the Bongeunsa temple in Seoul. Doing business? India lags behind Pakistan! Human development: India at a dismal 119!